Can America Survive Our Growing Virtue Deficit? Gary Bauer, Contributing Author: Yesterday we commented on the brutal murder of Christopher Lane, a young college student in Oklahoma, and how his death is being treated by the media compared to the Martin/Zimmerman confrontation, which was shamelessly exploited by the left. The Oklahoma incident will soon be purged from the public's consciousness because there is no narrative that serves the left. Today we have more evidence of why the left doesn't want to talk about the brutal Oklahoma murder. The evidence is growing that the shooter was a black racist who rejected everything that Dr. Martin Luther King believed in. President Obama sent the FBI to Florida to find evidence that George Zimmerman was a racist. Finding none, the Justice Department set up a call-in line to solicit anonymous tips. Still, nothing was found. But in the case of Christopher Lane's killer, all anyone has to do is check out the shooter's social media page. There he posted several tweets such as, "90% of white ppl are nasty. #HATE THEM," and "With my ni--ers when it's time to start taken life's." Hate crime, racism, anyone? Today we have news of another vicious murder in Spokane, Washington, where two thugs brutally beat to death an 88 year-old World War II veteran. I repeat: We are living in a country of disintegrating families, fatherless children, a declining Judeo-Christian moral code and aggressive secularism. This "culture war" is being stoked by left-wing politicians who constantly exploit identity politics to attack cultural norms and inflame tensions. President Obama won't address it because he has regularly played the race card. Too many Republican leaders won't address it because they are afraid of being labeled bigots. If men and women of goodwill of all races don't step up soon, our budget deficit and growing military weakness won't matter. Our virtue deficit will destroy this great experiment in ordered liberty under God. Tags: America, Virtue Deficit, Gary Bauer, Campaign for Working Families To share or post to your site, click on "Post Link". Please mention / link to the ARRA News Service. Thanks! ARRA News Service Editor: Pro-life supporters no matter where you live should consider putting your money behind your beliefs and values and supporting pro-life candidate Steve Lonegan for U.S. Senate. We don't need another pro-abortionist in the U.S. Senate. Washington, D.C. — American Commitment Action Fund (AC Action Fund) and Susan B. Anthony List (SBA List) are jointly releasing a new ad targeting Newark Mayor Cory Booker's radical record on abortion. The ad blasts Cory Booker's record of promoting abortion with no restrictions-including his significant role as Co-Chair of the Democratic National Convention's Platform Committee. Booker is the Democratic candidate for U.S. Senate in the special election to succeed Frank Lautenberg. The campaign is using the hashtag #BookerFAIL on Twitter, and the ad can be viewed online at: YourTube: #Booker or at BookerFAIL.com. American Commitment Action Fund (AC Action Fund) is dedicated to defeating big government liberals and electing free-market conservatives in races for federal office. Paid for by American Commitment Action Fund and not authorized by any candidate or candidate's committee. acaction.org. The Susan B. Anthony List, and its connected Political Action Committee, the SBA List Candidate Fund, are dedicated to electing candidates and pursuing policies that will reduce and ultimately end abortion. To that end, the SBA List will emphasize the election, education, promotion, and mobilization of pro-life women. Tags: #BookerFail, Cory Booker, pro-abortion, democrat platform, ad To share or post to your site, click on "Post Link". Please mention / link to the ARRA News Service. Thanks! “Hello, I’m Indiana Governor Mike Pence. “These are difficult days for too many Americans. Our economy isn't growing as fast as we would like, and businesses aren't creating as many jobs as we need. In states like Indiana, we’re working every day to give people more freedom to grow their businesses, but the over-regulation, higher taxes and new mandates coming from Washington, D.C. are stifling our economy and hurting efforts being made in states across the country. “Everywhere I go in Indiana, I meet business owners and workers who are in survival mode. They’re trying to figure out how to survive the new normal of more regulations, higher taxes and the impending costs and mandates of the Affordable Care Act, also known as Obamacare. “As implementation of this law gets closer, we are learning more about the burdens it will place on hardworking Americans. In Indiana, the Affordable Care Act will raise the average cost of health insurance in the individual market by an unaffordable 72 percent. “In addition, the Obama Administration is creating confusion in the marketplace, from its suspension of the cap on out-of-pocket expenses, to providing subsidies without verifying income, to a one-year suspension of the employer mandate, this health care law is weighing down our economy. It’s costing jobs, discouraging investment and making the future bleak for too many families. “But there is an alternative to waiting on Washington, D.C. to come to its senses and more Americans are realizing every day that the cure for what ails this country is starting to emerge… not in our nation’s capital but in our nation’s state capitals. “All across this country, 30 Republican governors are working hard to push back and preserve freedom. While Washington raises taxes, Republicans governors are cutting them. As Washington stifles job growth by adding new regulations, Republican governors are adding jobs by eliminating unneeded regulations and bringing fresh approaches to some of the nation’s greatest challenges. “Nowhere is this more true than in health care. Here in Indiana, we run a nationally-recognized program called the Healthy Indiana Plan. The Healthy Indiana Plan offers the uninsured an affordable health care plan with savings accounts that they control. Giving people in Indiana more freedom and more responsibility over their health care has improved outcomes and now 95 percent our plan’s enrollees are satisfied with their coverage. This is a perfect example of the truth that by letting freedom and personal responsibility work together, you reduce the need for government. Republican governors understand this truth, and the proof is in our results. In balanced budgets, lower taxes and less regulation that’s promoting job growth. 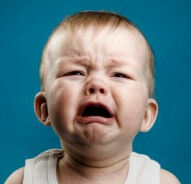 “These are tough times, and this health care law may make them tougher still. That’s why we should always remember on whose shoulders we stand-- and never forget as President Reagan reminded us, that ‘the states that created the federal government, the federal government didn't create the states.’ Our founders insisted that protecting the states’ power to govern themselves was vital to limit the power of Washington and preserve freedom. They were right then, and as Republican governors are proving every day, they are even more right now. More freedom and flexibility for the principled leadership emerging in states across this nation can and will promote good healthcare and a healthy economy. Tags: Gov. Mike Pence, Indiana, Republican, Weekly Address, Obamacare, Healthy indiana Plan To share or post to your site, click on "Post Link". Please mention / link to the ARRA News Service. Thanks! Act 1500, aka "Arkansas Obamacare"
by Glenn E. Gallas Sr.: The Arkansas 89th General Assembly passed HB 1508 (now Act 1500) called; THE ARKANSAS HEALTH INSURANCE MARKETPLACE ACT. This an act created to “promote competition among health insurance carriers; to decrease the cost of health insurance”. It would seem to me that this recent legislative creation would be an excellent solution to the teachers rising health care costs. What a great place to start implementing this piece of legislation crafted carefully and with much popular support( according to those who supported it) to aid our teachers in their time of need. Why would our legislators waste any more time on this when they have (according to those who supported it) “gone a long way in fixing our health care woes in Arkansas”. We should encourage Insurance Commissioner Jay Bradford to get on this right away as he has said that Health Care Exchanges (HCE’s) are the best way t solve the complicated issues of coverage and affordable, quality healthcare. Of course it goes without saying that our teachers deserve the very best and this would be the best solution to the problems before us. I would encourage everyone concerned about this situation (especially, Jason Rapert, Tommy Wren, Missy Irwin) to take this opportunity to ensure teachers healthcare insurance costs are lowered through the state-wide system they created for all other Arkansans. Make sure you tell them that allowing the school systems to raise the premiums for the teachers and expecting the citizens of Arkansas to pay for it is unacceptable. There are many ways to raise taxes without being held accountable for them. This is just such an opportunity in which the legislator will want to do something good and the people who pay for it will be you and I. If the legislator changes the rules and forces the school system to pay for it, property taxes go up and if the state subsidizes the increase general tax revenue goes up. The perfect solution again is to a) fix the problem using current systems in place or b) have the teachers do what every other Arkansan must do when their insurance premiums rise, make more or spend less. Arkansans were forced to swallow a bitter pill this past legislative cycle with the enactment of Obamacare in Arkansas. Now the unintended consequences are that certain segments of our state are gagging at the size of the pill! It’s time to swallow the pill or suffer the consequences; do not push others to swallow two pills because you find it uncomfortable to swallow one! I have a new saying about the so called “private option and HCE’s in Arkansas, “ All for one and One for all or NOT AT ALL! 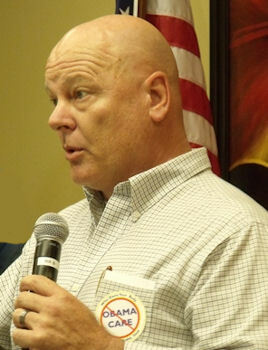 Glenn Gallas is a former Republican candidate for US Congress. Gallas is noted for inspiring excellence in leadership. As a conservative he has become active in many venues including being on the Dave Elswick Show KARN 102.9 FM and his On The Right Road Internet Radio Show. Tags: Arkansans, Choking, Bitter Pill, Obamacare, Act 1500, government employees, teachers, state legislature To share or post to your site, click on "Post Link". Please mention / link to the ARRA News Service. Thanks! Ken Blackwell, Contributing Author: The problems continue at President Obama's Environmental Protection Agency. Under fire for their leadership using private email addresses to illegally conduct official business and enacting new regulations through coordinated lawsuit settlements with outside environmental groups, the EPA shows no sign of slowing down in Obama's second term. Last month, in an attempt to deflect attention from scandals at the IRS, the NSA and the embassy in Benghazi, the Administration has turned its attention to the issue of climate change. At the center of their new environmental policies is the EPA's Renewable Renewable Fuel Standards, which mandates the use of ethanol and biofuels in the production of gasoline. This a prime example of misguided government regulation, as it punishes companies to use a type of hybrid fuel - known as cellulosic biofuel - which does not yet exist on the commercial market. In addition, drives up prices at the gas station for consumers (10 cents/gallon in 2011), while simultaneously driving up cost of food. Record-high corn prices have also led to increased pressure on other grains such as wheat and soy - both of which have jumped in prices and are found in animal feed and numerous food products. Experts at the agriculture investment house Rabobank estimate there will be a historic 14% jump in overall food prices in the next year. As our economy recovers, this is the last thing struggling families should have to endure. In 2012, during the worst drought for farmers in 50 years, the RFS diverted more than 50% our nation's corn supply into ethanol production. As corn is part of many foods you and I enjoy every day, even many left-wing global hunger advocates are opposed to the use of corn in fuel. Destroying food to be used in inefficient forms of fuel is bad policy with serious repercussions. In June 2012, three senators - John Barrasso (R - Wyoming), Mark Pryor (D - Arkansas), and Pat Toomey (R - Pennsylvania) launched a bipartisan effort to get rid of renewable fuel standards entirely. According to Sen. Barrasso, "The Renewable Fuel Standard is fundamentally broken and beyond repair. Instead of delivering meaningful environmental benefits, it's driven up food and fuel costs for American families. This flawed program will also inevitably lead to widespread lawsuits against American manufacturers. When Congress enacts bad policy, the right response is to scrap it and start over." It is clear that these fuel standards aren't working for consumers or refiners. Policy makers should focus on building more oil refineries and approving things such as the Keystone XL pipeline to transport tar sands oil from Canada into our country. 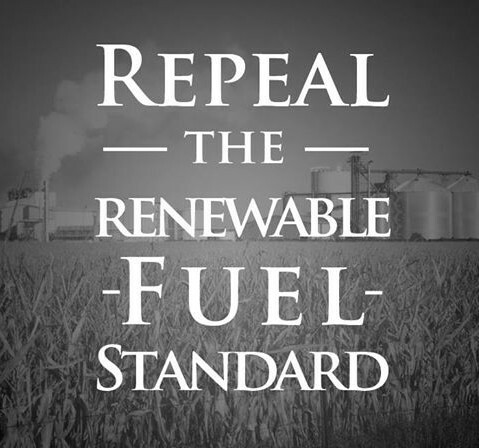 The Renewable Fuel Standard should be repealed. Ken Blackwell is a conservative family values advocate. Blackwell is a former U.S. Ambassador to the United Nations Human Rights Commission and as undersecretary in the Department of Housing and Urban Development, a former Ohio Secretary of State and State Treasurer, and former Mayor of Cincinnati, Ohio. He is a senior fellow at the Family Research Council and a visiting professor at Liberty University School of Law. He is a contributing author to the ARRA News Service. Tags: Environmental Protection Agency, EPA, foolish, ethanol mandates, repeal, renewable fuel standard , Ken Blackwell To share or post to your site, click on "Post Link". Please mention / link to the ARRA News Service. Thanks! by Ron Paul: Thanks to more documents leaked by Edward Snowden, this time to the Washington Post, we learned last week that a secret May 2012 internal audit by the NSA revealed 2,776 incidents of “unauthorized” collection of information on American citizens over the previous 12 months. They are routinely breaking their own rules and covering it up. 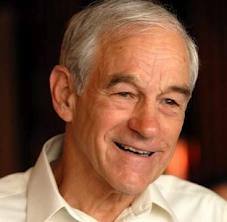 Dr. Ron Paul, Chairman of the Ron Paul Institute for Peace and Prosperity is a former Texas U.S.Congressman for 21 years. He twice sought the Republican Party presidential nomination and was a former Libertarian Party candidate for President. As a medical doctor, he served as a flight surgeon in the Air Force and has delivered over 4000 babies. Paul writes on political and economic theory and a critic of American foreign, domestic, and monetary policies, the military–industrial complex, the War on Drugs, and the Federal Reserve. He is also known for his love of country, the U.S. Constitution, and the protection of citizen's rights under that Constitution. Tags: Ron Paul, NSA, violations, privacy, Americans To share or post to your site, click on "Post Link". Please mention / link to the ARRA News Service. Thanks! 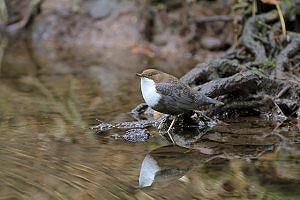 You Never know who you will meet close up! Dr. Bill Smith, ARRA News Service: I’m excited about joining the AFP Foundation on August 30th and 31st for their premier grassroots conferences of the year. I will be attending both the 6th Annual RightOnline 2013 and the 7th Annual Defending the American Dream (DAD) Summit in Orlando, FL. While the bloggers and other new new media activists may be focused on RightOnline and others free market conservatives will be attending DAD. It is not too late for you to join us. These events have become two of the best free market conferences all year, and you need to be there! In case you hadn't noticed, the far left is organized, motivated, and relentless. In order to stem the tsunami of big government threatening our nation, we have to be better informed and united in the cause of liberty. These two conferences are all about getting liberty lovers, like us, together so we can learn to make a big impact in the fight for economic freedom. With Obama’s gang of clowns in power for three and a half more years we have got to be vigilant in defending our country’s core principles. Whether it’s the health care takeover, global warming ideology, or wasteful government spending, we've got to be armed with the facts to combat the liberal spin machine every chance we get. This conference is the place to get all the info we need to make an impact. Don’t sit this one out…the stakes are just too high. If we don’t defend the American dream, who will? Sign up for the Defending the American Dream Summit and RightOnline and a chance to meet Michelle Malkin and many other great conservative leaders. Tags: RightOnline, 2013, Defending the American Dream Summit, DAD, Americas For Prosperity, Orlando Florida, conservative, limited government, free enterprise, speakers To share or post to your site, click on "Post Link". Please mention / link to the ARRA News Service. Thanks! In two and a half weeks, Congress will return to Washington, D.C. Unfortunately, due to the failure of the Senate Democrat leadership to take up House bills and to act responsibility, Congress will be once again under Democrat leadership will be faced with a decision on how to fund the government after Sept. 30. Two years ago, Washington came together in a historic bipartisan compromise to reduce out-of-control federal spending, helping to achieve the first federal deficit below $1 trillion since President Obama took office. But that was only the beginning. Now is not the time to revert back to Washington’s culture of wasteful spending and lack of accountability; taxpayers deserve better. Any effort to remove these bipartisan spending restraints is irresponsible and a step backward. Congress should pass funding consistent with the agreed upon annual spending levels and the president should use his authority to allocate spending cuts in an appropriate manner. The Budget Control Act of 2011 (BCA), a bipartisan bill signed into law by President Obama, enacted caps on discretionary spending. OMB has determined that discretionary spending will be capped at $967 billion in FY 2014. 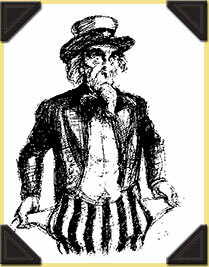 Congress must pass a continuing resolution at the end of September (end of fiscal year 2013) that abides by these established caps. If Congress kicks the can down the road by passing a continuing resolution that exceeds the statutory cap, it will effectively set up another round of across-the-board sequester cuts in January rather than addressing the issue now. According to the Congressional Research Service, discretionary appropriations that result in a “breach in discretionary spending caps” will trigger sequestration within “15 calendar days after the end of a session of Congress.” This means that instead of Congress and the president actually managing cuts or spreading the spending reductions across 12 months, the cuts will be compressed into 8 1/2 months. Just as President Obama rejected the opportunity to find smarter cuts, Congress also seems averse to making the tough decisions – and compressing the impact of the cuts will only make it worse. As Congress continues its work on discretionary spending bills, it should ensure no portion of FY 2014 spending exceeds the BCA level of $967 billion. In addition to the bipartisan majorities in the House and Senate and President Obama taking this good first step toward reining in unchecked spending, there was the Obama administration proposed the sequester. When first proposed, the debt had grown by $3.7 trillion in two-and-a-half years. Since taking office, the debt has grown by an unsustainable $6 trillion in five years. While there is still much more work to be done, any effort to undo the Budget Control Act would be a major step backward. The decision to delay sequestration – which amounted to three cents on the dollar in cuts – in 2013 increased uncertainty and left bureaucrats to manage the reductions. CBO: Under Sequester Spending Continues To Increase: "With those reductions, the overall limit on discretionary budget authority will steadily increase from $967 billion for 2014 to $1,147 billion for 2021, for an average annual increase of 2.5 percent. The separate defense and nondefense caps will follow a similar pattern. The cap on discretionary budget authority for the defense category will grow from $498 billion for 2014 to $590 billion for 2021, CBO estimates. The cap on non defense funding will increase from $469 billion for 2014 to an estimated $557 billion for 2021." (Sequestration Update Report: August 2013, Congressional Budget Office, 8/8/13)This time around, lawmakers and the Obama administration should plan for the minimal spending reductions they have already agreed to and enact them now. Government overspending is among the biggest impediments to economic prosperity, and we must continue on the path toward spending reductions to ensure a full recovery. JULY 2013: "Although Output Would Be Greater And Employment Higher In The Next Few Years If The Spending Reductions Under Current Law Were Reversed, That Policy Would Lead To Greater Federal Debt, Which Would Eventually Reduce The Nation’s Output And Income Below What Would Occur Under Current Law." "Although output would be greater and employment higher in the next few years if the spending reductions under current law were reversed, that policy would lead to greater federal debt, which would eventually reduce the nation’s output and income below what would occur under current law. Moreover, boosting debt above the amounts projected under current law would diminish policymakers’ ability to use tax and spending policies to respond to unexpected future challenges and would increase the risk of a fiscal crisis (in which the government would lose the ability to borrow money at affordable interest rates)." (Douglas W. Elmendorf, "How Eliminating The Automatic Spending Reductions Specified By The Budget Control Act Would Affect The U.S. Economy In 2014," CBO, 7/25/13)The American people are on the side of lawmakers who seek a culture of fiscal responsibility. Majorities of Americans believe the government spends too much, know there’s room to cut, and observe Washington being wasteful and reckless with tax revenue and borrowed money. Americans will reward the lawmakers who stand up for prudence, stewardship, and responsibility in Washington. Americans are pessimistic about the economy, but they are not looking for Washington to continue the same failed attempts to revive it. When politicians argue that cuts to government spending are the reason for job losses that means Washington has fostered conditions that stifle private-sector job creation and business growth. A short-term continuing resolution will buy time for the GOP and the president to work on a better way to implement cuts, but it should not delay the inevitable spending reductions. Sequester spending levels for 2014 should apply to the entire fiscal year. Ultimately, Congress and the president must address the looming entitlement crisis. The longer Washington waits to address these massive and expensive programs, the more difficult the solutions become. Real reform must be structural and constrain costs. Nearly five years after the so-called stimulus, there is no evidence showing that government spending creates long-term growth or permanent jobs. Approaching a weak economy with the same failed efforts would yield the same failed results. Reducing spending isn't about gutting the government of essential services it provides. Rather, it’s about making government more efficient, effective, and accountable. Congress and the Obama administration needs to make sure every dollar spent is being used as efficiently and effectively as possible so that we strengthen these programs for those who need them now and preserve them for future generations. Tags: Continuing Resolution, Congress, Obama administration, CBO, government spending, To share or post to your site, click on "Post Link". Please mention / link to the ARRA News Service. Thanks! LibertyNEWS TV -: From immigration to education, health care to business fortunes, Obama and his pack of progressives are pushing hard to reach a dangerous level of transformation. Tags: LibertyNEWS TV, Norvell Rose, immigration, education, common core, Obama Core, federal tuition assistance, health care, business fortunes, Bradley Manning To share or post to your site, click on "Post Link". Please mention / link to the ARRA News Service. Thanks! 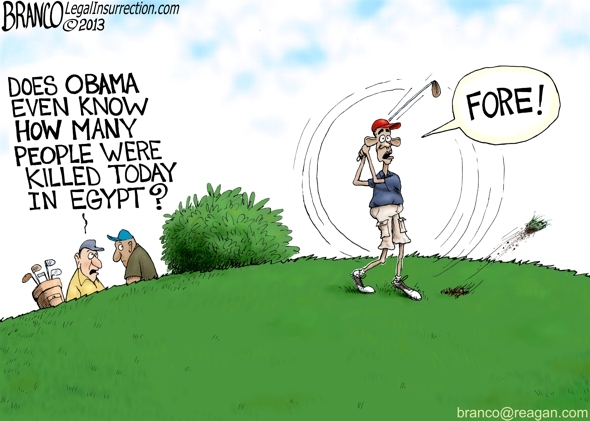 Tags: President Obama, golfing, Egypt, Foreign Policy, editorial cartoon, AF Branco To share or post to your site, click on "Post Link". Please mention / link to the ARRA News Service. Thanks! Alan Caruba, Contributing Author: I don’t know when it occurred to me that I had gone from having shaken hands with Caruba: I am Tired of Being Called a White Racist to being called a white racist, but apparently I was not paying attention. Neither were a lot of others of my generation who had welcomed and supported the Civil Rights movement only to discover we were not going to hear a word of thanks. Younger generations have suffered the same indignity. 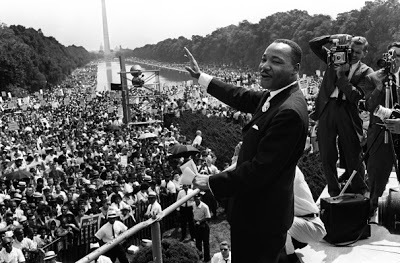 On Saturday, August 24, the NAACP is sponsoring a march in Washington, D.C. to commemorate the fiftieth anniversary of Dr. King’s famed “I have a dream” speech given on August 28, 1963. One wonders if the first black President of the United States will put in an appearance, but the White House did not have anything scheduled on its website. The whole nation went through the trial of George Zimmerman, the “white” Hispanic who shot Trayvon Martin, apparently the epitome of the virtues of black youth despite having been suspended from school several times and guilty of infractions that often put others his age in jail. Had Zimmerman not shot him, Trayvon would surely have gone to jail for assaulting him. Although the rate of juvenile incarceration has dropped 41% from its peak in 1995 and is down among all racial groups, black youth are nearly five times more likely to be incarcerated as their white peers. Latino and American Indian youth are two to three times more likely to find themselves behind bars as white boys and girls. I have heard all the sociological explanations about blacks and the criminal justice system. I am concerned that too many within the nation’s “African-American” population simply do not grow up with or absorb “white” attitudes about staying in school, getting a job, and raising a family; not all, but not enough. To all the blacks who stayed in school, went to college, married and are raising a family in the suburbs, my apologies for seeming to lump you in with those who did not and thank you for not adopting victimhood as your mantra. There is good news about blacks in America. U.S. Census statistics as of 2010 counted 2.4 million black military veterans that year. In 2010, 82% of blacks 25 and older had a high school diploma or higher degree. Indeed, 18% of that cohort had a bachelor’s degree or higher, and 1.5 million had an advanced degree. In 2010, there were 2.9 million blacks enrolled in college, an increase of 1.7 million since 1990. And then there is the bad news. Blacks represent 13% of the population, but according to a fact sheet of the National Association for the Advancement of Colored People, blacks “now constitute nearly one million of the total 2.3 million” Americans behind bars. In New York City, the successful “stop and frisk” police procedure has been deemed prejudicial by a judge who ordered that it be stopped. It is prejudicial if you parse the word and find it means to “pre-judge” an individual or situation that you may deem a potential danger. Everyone profiles everyone else all the time. The NAACP’s super sensitivity about the one HALF of the President’s racial identity that is black was recently demonstrated when a rodeo clown donned an Obama mask as part of entertaining the crowd. This device, using presidential masks, has been commonplace for decades, but the particular incident had the Missouri NAACP demanding that the Secret Service and other law enforcement agencies investigate it as a “hate crime.” The President hasn’t spoken a word about this absurd charge. Indeed, in 2008 when Obama was first elected, we were all assured that the nation was entering a “post racial” period in which whites and blacks would join hands and put the past behind them. Despite the growth of the black middle class and other examples of the benefits that flowed from the 1964 Civil Rights Act and other protections, the ugly truth is that too many blacks seem trapped in a 1960’s time warp with the same accusations and resentments still being expressed. Speaking solely for myself I am extremely disappointed by the failure of too many black Americans to simply admit that there is something terribly wrong in a community that has too many abortions, too many fatherless children, too much exploitation of welfare systems, too much drug use and trafficking, and too much blame on white racism for these and other ills. Instead of seeing evidence that the black community in America is mounting an effort to address its problems what I and others see and hear are the same tired race hustlers, Al Sharpton, Jesse Jackson, and others, spewing the same “blame whitey” rhetoric. It needs to be said that racism cuts both ways, but too much black racism gets a pass. Whites are not to blame at this point. One hopes the Saturday march in D.C. will reflect Dr. King’s generous and hopeful speech of fifty years ago. I doubt that will happen. © 2013 Alan Caruba. Alan is a writer by profession; has authored several books, and writes a daily column, "Warning Signs" disseminated on many Internet news and opinion websites and blogs. He is a contributing author at ARRA News Service. Tags: Martin Luther King Jr, civil rights movement, NAACP, August 2013, March, Washington, D.C., White Racist, Alan Caruba To share or post to your site, click on "Post Link". Please mention / link to the ARRA News Service. Thanks! 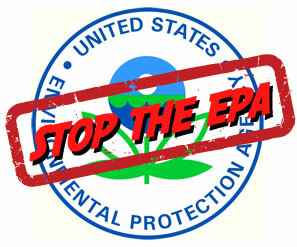 EPA Assault on States’ Sovereignty – and You! by Gary Baise: The EPA since 2009 has adopted a confrontational relationship with the states. This power grab does not impact just the states, but you and your pocketbook. In fact, an Illinois congressman said this about EPA: "There is an outlaw in Washington…and Congress must police it." A new report issued by the American Legislative Exchange Council entitled "The U.S. Environmental Protection Agency's Assault on State Sovereignty" demonstrates how out of control EPA has become. (Look at the attacks on Iowa and its regulation of CAFOs.) The report claims "EPA takeovers of state programs are up an astonishing 1900%." The report suggests this increased number has occurred mostly in the Obama administration. The report is clear in explaining that EPA is no longer engaging in working with the states and allowing the states to have the primary responsibility of cleaning up the environment. EPA seems to be only interested in command and control of virtually every aspect of American society. The report attacks a strategy of EPA’s known as sue and settle. Because so many states are governed by Republican governors, EPA has substituted state participation by working with groups such as the Sierra Club and NRDC. The report points out, "The practice involves friendly lawsuits that go straight to settlement discussions, during which EPA and the environmentalists litigants negotiate policy." ALEC claims that 40% of EPA's regulatory takeovers from the states are a result of the sue and settle strategy. According to the report, "Since 2009, the EPA has imposed at least $13 billion in annual regulatory costs that resulted from sue and settle litigation." These are what one would call sweetheart settlements because frequently the states are not notified by EPA. Even worse, ALEC describes a North Dakota Attorney General who sought to intervene in a case involving North Dakota, and if you can believe this, a court kept North Dakota out of the case and negotiation. Many of you are familiar with the fact that coal mining is being squeezed out of business in this country. Coal-fired power plants are shutting down with increasing frequency. Part of this retirement of megawatts of power is caused by lower-cost natural gas. EPA is also a culprit because it has proposed and is implementing regulations to control carbon pollution. These regulations effectively ban the construction of new coal-fired power plants. EPA has already issued rules which regulate existing coal-fired power plants, and ALEC believes these regulations will lead to the retirement of 81,000 megawatts. The ALEC report describes the congressional vision for EPA when it originated in 1970. In theory, there was to be cooperative federalism meaning that EPA and the states would work cooperatively to have a balance between environmental protection and economic progress. Congress made clear that air and water pollution prevention was to be the primary responsibility of states and local governments. "EPA has radically altered this balance of power," says ALEC. The report should be required reading on Capitol Hill. It should be required reading for every state legislator because as the congressman from Illinois states, "There is an outlaw in Washington…" If EPA is not controlled by legislators and Congress, then there is no one to police it. In the end, the harm is visited on not the states, but you. Gary H. Baise is an Illinois farmer and trial attorney at the law firm Olsson Frank Weeda Terman Bode Matz PC. Specializing in ag and environmental issues, he also serves as outside General Counsel for the U.S. Grains Council, Agricultural Retailers Association, National Association of Wheat Growers, and National Sorghum Producers. He first shared this article in the Jefferson Policy Journal of the Thomas Jefferson Institute. Tags: EPA, sue and settle, Sierra Club, NRDC, EPA Assault on, State Sovereignty, American, American Legislative Exchange Council, attacks on Iowa, Gary Baise To share or post to your site, click on "Post Link". Please mention / link to the ARRA News Service. Thanks! 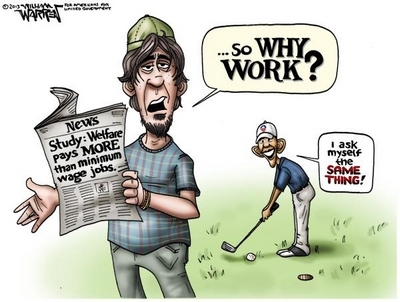 Tags: Why work, welfare, minimum wage. President Obama, editorial cartoon, William Warren To share or post to your site, click on "Post Link". Please mention / link to the ARRA News Service. Thanks! Ken Blackwell, Contributing Author: Congress has been ceding power to the executive branch for more than two decades. In the 2008 presidential election, President George W. Bush was often criticized by then-candidate Barack Obama for his executive overreaches. Candidate Obama even promised to “reverse” the Bush Administration’s expansion of executive authority in 2007. However, no president in modern history has done more to circumvent Congress and rewrite legislation than President Obama has. While the Obama Administration’s rewriting of the Affordable Care Act (ACA) to delay timeframes may immediately come to mind, perhaps the most blatant example of executive branch overreach is the Justice Department’s decision to rewrite more than 50 years of consistent interpretation of the Wire Act of 1961 to allow revenue-seeking state governments to go into the online gambling business. Perhaps most disturbingly, the Justice Department’s decision is clearly a result of back-room deals, coming without a single Congressional hearing or public discussion on the topic. And, to compound matters, the decision was released on Christmas Eve 2011 – an extreme version of the infamous Friday afternoon news dump. Since 1961, both Democratic and Republican administrations interpreted the law to prevent states from instituting online lotteries. However, facing pressure from the President’s home state of Illinois and the Vice President’s home state of Delaware, the Attorney General said states can not only institute online lotteries, but also other online gaming, including poker, slots and blackjack. In addition to the Wire Act of 1951, the Unlawful Internet Gaming Act of 2006 (UIGEA) makes it illegal to transmit or accept Internet payments in connection with gambling. Through these two pieces of legislation, Congress clearly asserted itself. Yet, the Administration used an executive directive to reverse the legislation's clear intent, sending big-spending states facing budget deficits into a furor over which one could be the first to capitalize. Unsurprisingly, it was the President’s home state of Illinois that struck first, followed by an expansion of online gaming in other cash-strapped states including Delaware and New York. Until recently, Congress was largely silent on the issue. But, last month, the Senate Subcommittee on Consumer Protection, Product Safety and Insurance held a hearing on the fallout from the DOJ’s hasty decision, particularly with respect to vulnerable populations, notably teenagers and young adults and the elderly. In testimony before the subcommittee, Catholic Advocate President Matt Smith cited the CEO of the leading lottery provider in the U.S., who stated that his company sought to attract “younger players” via online gaming and noted that Internet-based gambling platforms have few protections in place to exclude underage players. Senior citizen groups have expressed similar concerns. 60 Plus Association Chairman Jim Martin wrote in a letter to Senator Kelly Ayotte, who sits on the subcommittee, that expanded online gambling "leaves millions of seniors vulnerable to losing their life savings to online predators and overseas scam artists who have only been encouraged by this rule change"
Congress needs to reassert itself and make its ban on government-sponsored Internet gambling explicit, taking back control and oversight over trade and commerce in the process. Our elected representatives should be a bulwark against executive overreach and move to halt the Obama Administration's now-familiar practice of legislating by fiat. Vulnerable populations shouldn't have to pay the price for the inability of a handful of liberal states to rein in government spending. Ken Blackwell is a conservative family values advocate. Blackwell is a former U.S. 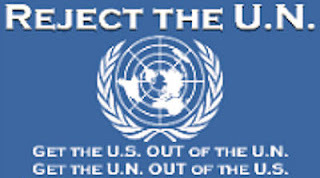 Ambassador to the United Nations Human Rights Commission and is a senior fellow at the Family Research Council.. He is a contributing author to the ARRA News Service. Tags: Obama administration, executive orders, Affordable Care Act (ACA), Justice Department, decision, Wire Act of 1961, Attorney General, state online lotteries, Administration executive directive, reverse the legislation, online gambling, Congress, Ken Blackwell To share or post to your site, click on "Post Link". Please mention / link to the ARRA News Service. Thanks! Gary Bauer, Contributing Author: As you know, four Americans, including the U.S. ambassador, were killed on September 11, 2012, during a series of attacks against our consulate in Benghazi, Libya. An independent commission, led by former Joint Chiefs of Staff Chairman Adm. Mike Mullen, blasted Hillary Clinton's State Department for "systemic failures and leadership and management deficiencies." But this week, after another "thorough review" determined that none of the individuals "breached their duty," the bureaucrats were cleared of all responsibility and installed back in their jobs by Secretary of State John Kerry. Keep in mind that their suspensions had nothing to do with covering up the events that took place in Benghazi that night. These individuals were suspended because of the dereliction of duty in responding to repeated pleas from Americans on the ground for more security PRIOR to the attack. You may recall that Eric Nordstrom, a former security officer in Libya, testified before Congress about his frustration in dealing with the State Department, which kept rejecting his requests for additional security. Nordstrom said, "For me the Taliban is on the inside of the building," referring to the State Department. So if these folks didn't do anything wrong, why did Hillary kick them out? One of the four, Raymond Maxwell, has always maintained he was wrongly scapegoated. Members of Congress are furious. Rep. Darrell Issa (R-CA), chairman of the House Oversight and Government Reform Committee, said:"Instead of accountability, the State Department offered a charade that included false reports of firings and resignations and now ends in a game of musical chairs where no one misses a single day on the State Department payroll. It is now clear that the personnel actions taken by the department in response to the Benghazi terrorist attacks were more of a public relations strategy than a measured response to a failure in leadership. "Under pressure from senators during her testimony before the Senate Foreign Relations Committee as to why our consulate in Benghazi was attacked, Hillary famously screamed, "What difference does it make?" It is increasingly clear that to this administration none of it makes any difference. 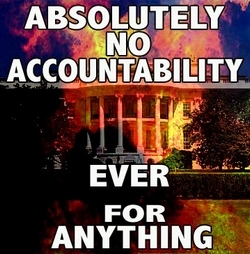 No one is being held accountable -- not the terrorists who attacked our consulate nor the bureaucrats who denied requests for additional security. Speaking of zero accountability, even though Hillary claimed responsibility for Benghazi, she now demands $200,000 in speaking fees. Unless the GOP is able to get its act together, she is on the way to becoming president of the United States in spite of the Benghazi fiasco. Tags: Obama administration, no accountability, Hillary Clinton, Benghazi, Gary Bauer, Campaign for Working Families To share or post to your site, click on "Post Link". Please mention / link to the ARRA News Service. Thanks! Alan Caruba, Contributing Author: I have a case of the Obama blues, a nagging depression that is exacerbated daily by having to listen to the endless lies he tells about everything when he isn't blaming Congress, the Republicans, and everyone else for the horrid state of the economy and his rejection of the leadership America demonstrated through both World Wars and since. Listening to Obama say that he intends to ignore Congress and selectively not enforce the laws it passes is such a serious threat to the Constitution and to our most fundamental freedoms that it is impossible not to be depressed by this grossly incompetent, historically ignorant, and pathologically narcissistic president. The Republican Party seems to be suffering from the same ailment, but one bit of good news was the recent gathering of Republicans that showed some gumption when they voted to reject CNN and NBC as primary debate hosts, given their announced intention to air dramas whose only intention is to re-write Hillary Clinton’s history of failed policy making. The old go-along-to-get-along GOP senators and representatives undermine the other elements, chiefly the Tea Party Republicans elected to bring a stop to Obama’s destruction of the economy and their party. They are joined in this by a former, but strangely quiet element, the evangelicals concerned with social issues, and independents who lean toward conservative policies. The fact that the mainstream media, with a few exceptions, are little more than the propaganda arm of the Democratic Party adds to the general feeling of being up against forces that undermine the well-being of the nation. 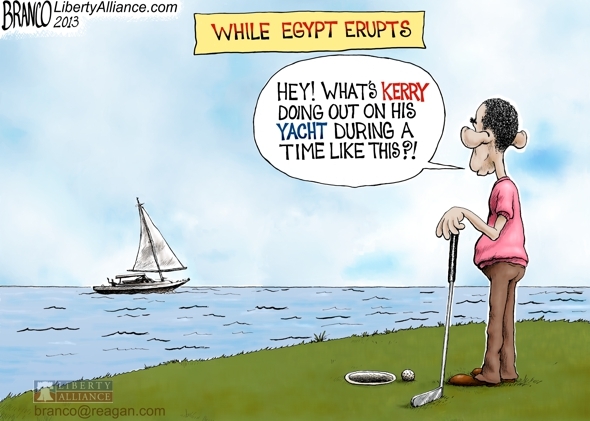 It is depressing to see how the scandal of the Benghazi attack has been swept under the carpet. It is depressing to know that the “newspaper of record”, The New York Times is just a communist rag, but one that sets the agenda every day for most of the rest of the news media. Adding to my unhappiness is the knowledge that Obamacare is now the law of the land despite being a complete disaster that is killing jobs, driving physicians to leave the profession, imposing death panels, and increasing the cost of health insurance for everyone. Recall the avalanche of Obama’s lies that we could keep our personal doctor and not have to change our insurance provider. The illegal delay in implementing one element and the many politically inspired waivers are testimony to the way this bill is already a monumental failure. Knowing that the government can and probably will monitor all my electronic communications—emails and telephone calls—is depressing; particularly since it ignores the Fourth Amendment. Tyranny is just around the corner if limits and oversight are not vigorously applied to the NSA and God knows who else is doing this. The President has surrounded himself with men and women who demonstrate such contempt for the public that I find that depressing too. Whether it is the new director of the Environmental Protection Agency or the new Secretary of the Interior, the message is the same. If you don’t spout global warming/climate change lies, you are not welcome to work for these and other government agencies. Their attitude says that, if the thousands of new regulations being generated will harm the economy, we don’t care. We are not public servants; we are the President’s appointees. For someone who has spent most of his life during America’s ascendency as a superpower and seen presidents from both parties demonstrate leadership that brought the former Soviet Union to its knees and encouraged a booming economy, it is particularly galling to watch a man who has said in so many ways that he does not like America, does not like its military, does not care about the ancient tradition of marriage, does not want to take steps to stem the traffic of illegal aliens, would eliminate the Second Amendment in a hot minute, and would far prefer to take another vacation and play along round of golf than shoulder the responsibilities of the presidency. He knows the news media will protect him. He knows that adding more and more Americans to welfare programs such as food stamps makes them dependent on the government, He knows that Americans are too beset with their own problems, paying their mortgage or rent, raising children, and dealing with the rising cost of living, to devote much time or attention to what he is doing to them and the nation. Ours is a nation with a short-term memory and, in too many cases, no memory or knowledge at all of our history and the values that lifted us to former greatness. The Obama blues are the result of two elections with very bad results; elections that very well may have been stolen by the kind of chicanery we associate with “Chicago politics” in a state that keeps putting its governors and elected representatives in jail. The sadness that invades my days comes from knowing that this feckless, Marxist ideologue and fan of Islam is quite literally ruining the lives of millions of American, old and young, destroying and delaying their dreams and plans. There is a cure for the Obama blues. It is citizen participation in the forthcoming 2014 midterm elections that could maintain and expand Republican control of the House, and return it to power in the Senate. There is no other option. 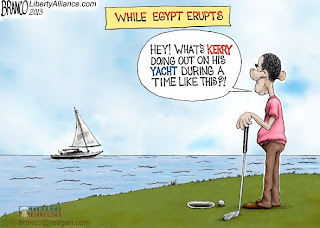 Failing that, Obama will have no brake on his “fundamental transformation” of America into a banana republic. 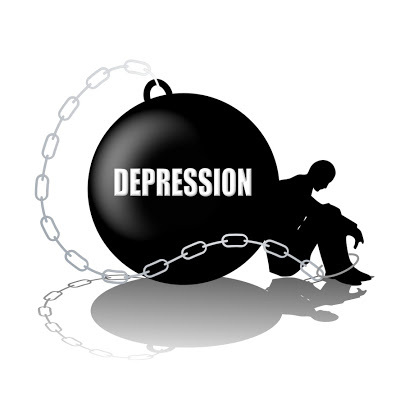 Tags: Obama blues, depression, Chicago politics, 2014 elections, Obama, transforming America, banana republic, Alan Caruba To share or post to your site, click on "Post Link". Please mention / link to the ARRA News Service. Thanks! 15 Pictures of Ridiculous Government Spending . . .
Kelsey Harris, Heritage Foundation: In 2013, federal spending approached $3.5 trillion. Now that’s hard to wrap your brain around. It’s about $27,700 for every American household. All across America, families balance their budgets, rein in spending, and pay down their debts. If Americans can do it, why can’t the federal government? Instead, they’re wasting your taxpayer dollars on programs like the ones below. We've compiled just 15 examples of the ridiculous spending that is driving America toward a $17 trillion national debt. 1. GATHERING DUST: The Transportation Security Administration let 5,700 pieces of unused security equipment worth $184 million sit in storage in a Dallas, Texas, warehouse, which costs $3.5 million annually to lease and manage. Taxpayers lost another $23 million in depreciation costs, because most of the 472 carry-on baggage screening machines had been housed there for nine months or more. That’s a lot of money! 2. 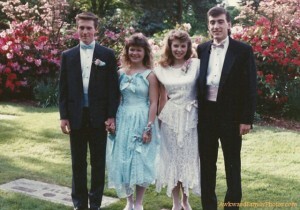 DANCE THE NIGHT AWAY: The National Science Foundation used part of a half-million dollar grant to develop a video game that simulates a high school prom. 3. BIRD IS THE WORD: The U.S. Air Force Office of Scientific Research spent $300,000 on a study that concluded the first bird on Earth probably had black feathers. 4. 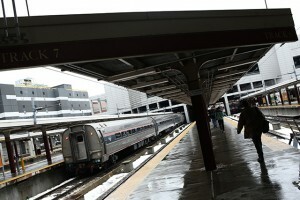 CAFÉ CAR: Taxpayer-funded Amtrak recovered only 44 cents of every dollar of its food and beverage costs on long-distance routes, which already annually lose money. 5. SO MUCH FOR ROBOT NANNIES: The Office of Naval Research spent $450,000 on a study that determined unintelligent robots do not have the ability to maintain a baby’s attention. 6. RENOVATIONS ON A PRESIDENTIAL SCALE: The Oval Office is getting a facelift. 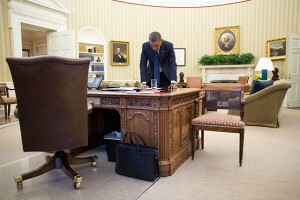 While it’s out of commission, the President will need a pseudo-Oval Office, right? $376 million will go to an Oval Office renovation and plans to construct a second office for the President to use during the renovation. 7. 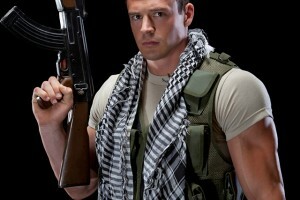 FELLAS, GET YOUR GUNS: Do you think this guy appears taller, stronger, and manlier? The U.S. Air Force Office of Scientific Research spent $681,387 on a study to confirm that he does—when he’s carrying a firearm. 8. THAT’S ILLOGICAL, CAPTAIN: The Internal Revenue Service spent $4.1 million on a lavish conference in 2010 for 2,609 of its employees in Anaheim, California. Expenses included $50,000 for line-dancing and “Star Trek” parody videos, $135,350 for outside speakers, $64,000 in conference “swag” for the employees, plus free meals, cocktails, and hotel suite upgrades. 9. DOUBLE DIPPERS: In 2010, 117,000 people who double-dipped into Social Security’s disability insurance program and the federal unemployment insurance program received $850 million in cash benefits. 10. GET IN THE HOLE! Did you know that golfers who imagine that the hole is bigger boost their confidence and accuracy? Thanks to the National Science Foundation, Purdue University, and $350,000 in taxpayer money, now you do. 11. MORE THAN POTATOES: In 2012, the U.S. Department of Agriculture spent $300,000 on activities promoting caviar produced in Idaho. 12. IT’S THE UNLIMITED ICE CREAM: The U.S. Department of Agriculture awarded a $149,992 grant to researchers at Fairleigh Dickinson University in New Jersey who are trying to eliminate the infamous “freshman 15” by studying college students’ on-campus dining selections. 13. GIRL POWER? A $100,000 grant from the National Endowment of the Arts funded a video game that depicts a female superhero sent to save planet Earth from climate changes allegedly caused by social issues that affect women. 15. WELL, THEY CAN’T WORK…: 1,000 prisoners like these in Pennsylvania collected weekly unemployment benefits over a four-month period, costing taxpayers $7 million. 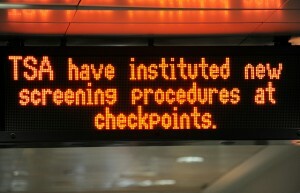 Thank you, poor oversight! If you’re as mad as we were after reading this list, forward along to your friends. Make sure they know where their tax dollars are really going. Read about more ridiculous spending here. Tags: Air Force, budget, Department of Agriculture, federal government, federal spending, Federal Spending by the Numbers, government spending, government waste, Health and Human Services, Idaho, Internal Revenue Service, Morning Bell, national debt, National Science Foundation, Oval Office, tax dollars, taxpayer dollars, taxpayers, Transportation Security Administration, unemployment insurance To share or post to your site, click on "Post Link". Please mention / link to the ARRA News Service. Thanks! by Michelle Malkin, Comentary, GOPUSA: Republican National Committee Chairman Reince Priebus had a message last week for outspoken conservatives who support strict immigration enforcement policies: Shut up. I think he's right. I also believe it's no coincidence that the RNC is now publicly marginalizing those who dare to challenge the rose-colored DREAMer propaganda of McCain-Graham-Rubio-Ryan-Mark Zuckerberg-La Raza -- just as the forces of Amnesty Incorporated conspire behind closed doors. 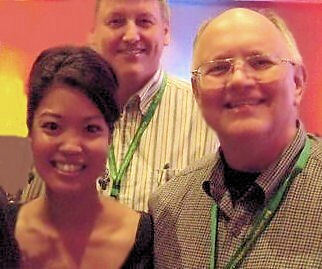 Michelle Malkin is the author of "Culture of Corruption: Obama and his Team of Tax Cheats, Crooks and Cronies" (Regnery 2010). She is on facebook here. Tags: RNC, chair, Reince Priebus, Open-borders, pandering, Michelle Malkin To share or post to your site, click on "Post Link". Please mention / link to the ARRA News Service. Thanks!